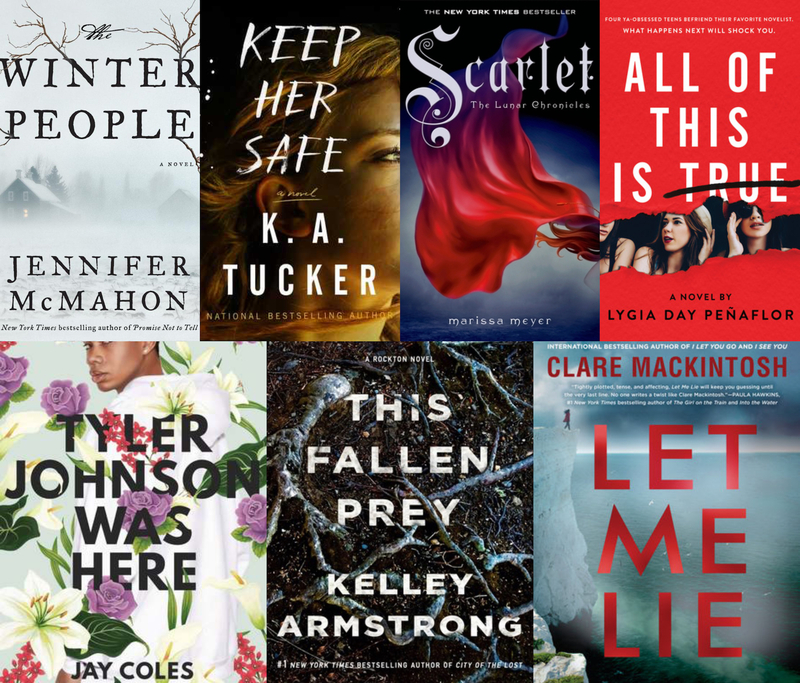 Well, as usual these days, this April wrap up of reads is quite late, but although my list of books completed was shorter than usual this month, there were some good ones so I’m excited to share them with you. After devouring about half a dozen of her novels, I’ve had a stack of the three most recent Jennifer McMahon books on my shelf waiting to be reading for a couple years now, and I figured it was time to actually read them (especially when the library had the audiobooks I could borrow!). I started off with Burntown last November, and after picking up The Winter People by Jennifer McMahon this month, I’ve only got one left to read (The Night Sister). 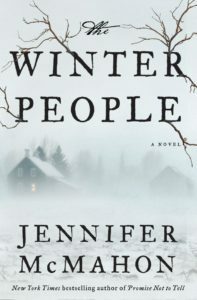 The Winter People takes place in Vermont, McMahon’s home state and one of her favourite settings for books, in a town, West Hall, where there is an old legend about Sara Harrison Shea, who was found dead in a field not long after her daughter died in 1908 and is said to still haunt the town. Sara’s story is interpersed with a present day story of teenage Ruthie, who lives in Sara’s old house with her mom–who just disappeared–and her younger sister. Ruthie’s search for her mother leads to a connection with Sara’s mystery. McMahon does an excellent job with the ominous tone, and while many of the twists are predictable, it’s so well-paced and well-written that I really enjoyed it regardless. There are a lot of characters but they still all feel fully fleshed out, and combined with an excellent setting, this definitely makes The Winter People one of my favourite McMahon novels. You ever read one of those books you really don’t want to finish but you’ve already committed so much time you can’t bear to give up? 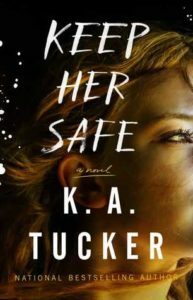 That’s exactly how I felt 200 pages (out of 436) into Keep Her Safe by K. A. Tucker, a novel described as a “romantic suspense” which failed to deliver on both the romance and the suspense elements. This is the story of two teenagers, Noah and Gracie, who are former childhood friends brought back together by their parents deaths. Gracie’s father was a corrupt cop murdered in a drug deal gone wrong, back when he was partners with Noah’s mother, who has just committed suicide and left a cryptic message regarding her guilt in the death of Gracie’s dad. In Keep Her Safe, Gracie and Noah work together to uncover the truth about what happened to her dad, find themselves drawn together in the process. The intensity in the book builds incredibly slowly, and the book felt very really long. While there was nothing wrong with the writing itself, it seemed like it took twice as many pages as were needed for anything to happen, with mostly the characters just running around accomplishing nothing (or waiting for something to happen). As a result I didn’t really care much about the characters or the outcome. Although I didn’t guess every single twist, the story was fairly predictable, and I definitely didn’t feel surprised by the ending. I can’t see myself picking up another book by Tucker in the future, but I did love the scenes with the dog! I adored Cinder when I read it last year and it easily made my top 10 books of the year, but I somehow got distracted from continuing on with the series, a fact I remedied this month when my library hold on the audiobook of Scarlet by Marissa Meyer came in. The audiobooks for this series are fantastic and I highly recommend them, and I enjoyed Scarlet just as much as its predecessor. This series features Cinder, a cyborg mechanic, but this book adds in another main character, Scarlet, whose grandmother is missing and who teams up with Wolf, a street fighter, to find her. 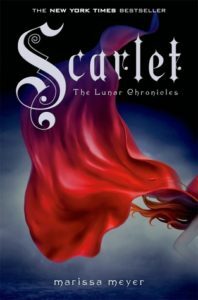 The point of view in Scarlet moves between Cinder and Scarlet, and while I did miss having just Cinder’s perspective, I really enjoyed Scarlet’s voice as well, and Meyer does an excellent job balancing all the plots. It was great to get more of Cinder’s back story, although the book was jammed packed with so much story it almost felt like there wasn’t quite enough time for it, Meyer just manages to squeeze it all in. There was plenty of action, but also lots of world building and a new character, Thorne, an outlaw with a space ship, I especially enjoyed. Thorne really added an element of fun and humour to the world that I appreciated. After the disappointment of Renegades it was so nice to get back to the Lunar Chronicles and I cannot wait to pick up the audiobook of the third novel, Cress, next. Honestly one of the easiest ways to sell me on a novel is to promise me “mixed media”, or a book that tells the story using multiple formats (emails, transcripts, interviews, newspaper clippings) and that’s exactly what made me want to pick up All of This Is True by Lygia Day Peñaflor, a novel about a group of teens that befriend a famous author only to find themselves featured in her next novel. Unfortunately even though I thought the premise and the format of All of This Is True was great, I didn’t care about any of the characters who were generally uninteresting. There are a lot of excerpts from the fake novel by the author, and those definitely did not convince me she would have had such a cult following. The pace of the book was also really slow for something I expected to be more of a mystery/suspense, and the few twists were generally pretty guessable, although it did still keep me reading and turning the pages since I basically read this book in one day on my way home from Denmark. I did feel like Peñaflor captured the complicated high school friendships and I found the portrayal of the author very interesting, but overall All of This Is True wasn’t terrible but also wasn’t particularly memorable or special. Every once in awhile the hype (generally in addition to an audiobook from the library) convinces me to read a book, and that’s what happened with Tyler Johnson Was Here by Jay Coles, but I’m glad it did. This is the story of Marvin, a teenage boy whose brother Tyler is involved with some bad people and goes missing after a party. The synopsis tells you this is because he has been killed by the police, and my major issue with the book is that you get two thirds into the book before that happens. I really appreciated the complexity of Marvin, his journey is incredibly interesting and thought-provoking. Some of the other characters lacked the same complexity as Marvin and I think the writing could still use some improvement, but I really enjoyed the audiobook narration and recommend that format if you’re looking to pick up the book. Coles tackles a lot of different issues in the book it is an important perspective to read from. 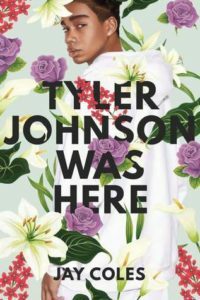 Of course the topic makes it hard not to compare to The Hate You Give, and while the writing and the pacing means it doesn’t quite reach that level of success to me, if you’re looking for a book to read next after THUG, I’m definitely recommend Tyler Johnson Was Here. 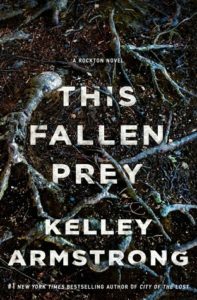 The Rockton series by Kelley Armstrong is easily one of my favourite series, so after adoring the first book City of the Lost (reviewed here) and the second book A Darkness Absolute (reviewed here), which made it onto my top 10 books of 2017, I had pretty high expectations for book 3, This Fallen Prey by Kelley Armstrong. This book continues the story of Casey, who leaves behind her life as a police detective to move up to the Yukon to a town, Rockton, where people go to disappear. Only it turns out that Rockton is not nearly as safe as promised, and while I won’t share any spoilers from previous books, in This Fallen Prey, a new visitor is dropped off and bad things start to happen. And no, even though it’s an Armstrong novel, none of those bad things are paranormal. While I still really loved the main characters and the writing in This Fallen Prey, I felt like the story itself wasn’t quite as strong as the previous books, or maybe I just started to expect things and didn’t feel quite as surprised as I did previously. That said, there was plenty of intensity, romance, and mystery, I just felt like there wasn’t much development. As always, the wilderness setting is excellent and I really felt like this book took advantage of it. Unlike City of the Lost which was written as a standalone novel, This Fallen Prey has the classic Armstrong cliffhanger, so I’m definitely looking forward to picking up book 4 when it is released in 2019. If you are looking for a thrilling read with fantastic characters, I highly recommend this series. 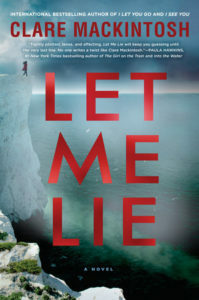 Let Me Lie by Clare Mackintosh is a mystery novel about Anna, whose parents killed themselves only a few months apart the previous year. Now a mother herself, Anna is still trying to come to terms with their deaths, when she receives a message that forces her to question what actually happened. Although the beginning of Let Me Lie is pretty slow, and at times the writing could feel a bit repetitive, the story definitely picks up intensity. 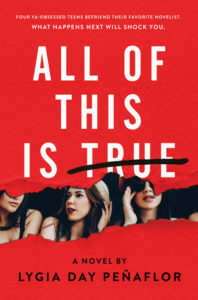 The novel is jam-packed with plot twists and while they are occasionally predictable or outlandish, there was still plenty to surprise and thrill me. My favourite character was Murray, the retired detective that helps Anna with the case and has a heart-warming storyline with his wife. Let Me Lie is the second book I’ve read by Mackintosh, following her sophomore novel I See You last year, and I’ve actually heard her debut I Let You Go is the best of the three, so I do plan to pick that up. Mackintosh’s novels are definitely page-turning reads so I could easily see her becoming an auto-read mystery author for me in the future. And that’s it for April! I’ve got to admit that my TBR book stack is getting out of control, and worse, I’m going to be in California from June to August and can only take so many physical books with me, so I’ve really got to focus on getting through a few more before the month is over. Hopefully you’ll see a nice big roundup from May. What have you been reading lately? Have you picked up any of these books? Let me know what you thought if you did!